While you prep, drain cherries well in a strainer. Line a 9 x 9-inch square pan with foil, shiny side down. Sift flour, cocoa, baking powder & salt onto wax paper. Stir together eggs, sugar, yogurt, oil & vanilla in a bowl by hand, no mixer. Fold in drained cherries and chocolate chips. Spread into pan and bake for 25 minutes. Cool in the pan (or try to). Notes: Dutch processed cocoa is less bitter and darker in color than Hershey’s natural cocoa. If you use Hershey's, omit the baking powder and use an equal amount (1/4 tsp.) of baking soda. 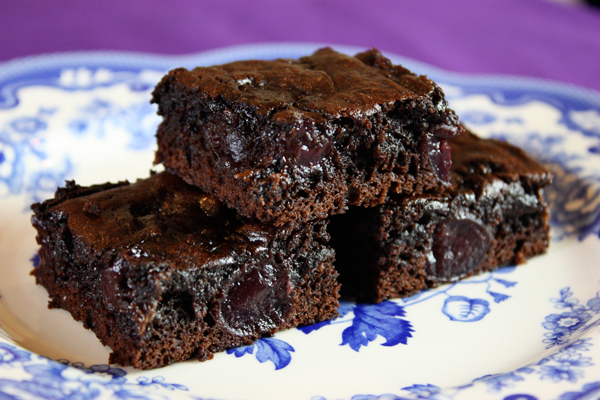 36 Comments on "Black Forest Brownies"
I love all your recipes i was wondering can i use frozen cherries for this recipe. I have never used frozen cherries but I think they may be too dry. Thanks, Marils! Those are 2 great tips I’ll try for the next batch! I also thought about soaking dried cherries in kirsch before adding to the batter. How can I substitute the sugar with honey or maple syrup? Using either one will make the brownies heavy and dense. Can these be frozen also can normal olive oil be used instead of extra Virgin? They can be frozen; however, this recipe calls for extra-LIGHT olive oil, not extra-virgin. The light olive oil has a mild flavor, better for baking. Just made these, just incredible! So easy, so moist and delicious! I took a picture, but don’t know how to post! I will send it to you via Facebook, I hope it’s ok? You can use the “Your Photos” link at the top. I made these last night and they turned out very nice. Though I did not use cherries. They were fine without them. So is it Okay to not use cherries? Because in one of the comments which you replied to it says cherries give the moisture needed, but mine were pretty nice. I would love your advice on what to put on the place of cherries, since they can’t be found at this time of the year in my country. I have only made these muffins with canned cherries so I would hate to recommend something I have never tried. But I’m glad they turned out without the cherries. hi, i baked it just only now.. nd i could say its perfect 🙂 addtional for my recipe. . thanks nd god bless always. Hi jenny,is it OK to use cherry pie filling ,I can’t find cherries in syrup . I would not recommend cherry pie filling for this recipe because it will be too thick and will likely make the brownies heavy and dense. Your fan club from Bangkok, Thailand. I tried this recipe today. Just finished. It’s a pity that there is no video. I would like to know that have to cut cherry or not. But I did not cut it. Anyway it looks great. I am a new baker but I learn from you and do many recipe. Thank you so much. Love you, Jenny. You did it correctly. You do not cut the cherries but even if you did, it would still be okay. Can’t wait to try these. We had brownies like this in Budapest this summer. As I cant get the canned cherries in Kyrgyzstan, Central Asia, I took fresh cherries and marinated them in cognac. I also switched the vanilla flavour for almond essence. Although the brownies were a little moist, this gave a great taste to the brownies and a little tipple to drink afterwards! I will make these again. Thank you. Sarah. What should these look like when done. Mine were completely raw when I took them out of the oven. Mine always look like the photo so I’m thinking maybe the time in the strainer did not drain enough of the liquid away from the cherries. It’s hard with some recipes when products vary so much. If you try it again I would suggest that after draining them, you pat the cherries with paper towels before adding them to the batter. If you followed the recipe exactly then it could only be too much liquid (or not enough flour) that would cause them not to bake properly. (or, if the oven wasn’t hot enough, that could do it too). Please let me know if you can share more details and I will try to help. It’s important to me that my recipes work for everyone. Can you give me advices, its difficult to get thick Greek 2% yogurt in my country, can i use any yogurt with any brand…??? also can’t find this dark sweet pitted cherries in syrup in the groceries in here (my hometown)… can i skip it or what kind syrup that i have to use to…??? You can use any kind of yogurt, preferably one that is thick. Full-fat or low-fat will work but not fat-free. This recipe depends on the juiciness of the canned cherries so I’m not sure if the brownies will be moist enough without them. However, you could try using chopped fresh cherries if available. I cooked these this morning using Australian brands hav’nt tried yet but looks amazing im taking it for morning tea tommorow and tried your lemon blondies awesome. Jenny, I could only see canned Bing cherries in syrup at my grocery store. Will these work or should I be looking for something else. Also, I couldn’t find anything close to Dutch processed cocoa. I’m sorry, I should have been more clear in my recipe and I will fix it. You can only get canned cherries in syrup so that’s what I use and Bing cherries appear to be sweet dark cherries like mine. And go ahead and use Hershey’s or another brand of unsweetened cocoa. If they are not Dutch processed, just switch from baking powder to baking soda. You won’t get as dark a color as mine but they will still taste good. Let me know how they turn out. I don’t think fresh cherries would work. Canned ones are much softer and have a lot more moisture, which I count on to make the brownies soft and moist. Can frozen cherries be used in place of the canned? I have only used canned cherries and I love that they are full and fat and very juicy. I’m not sure that frozen ones would have as much moisture, which makes these brownies so fudgy… that’s my best guess since I have never used frozen cherries. I would try and stick with canned if you can get them.